238 guests joined us for courses throughout the year (10% up on 2016) and our most popular courses were Bee Keeping with 52 guests, closely followed by learning how to Bake Bread with 37 guests and 29 people discovering the joys of Keeping Chickens. We ran 4 Corporate Team Days, worked with many schools & young people teaching 881 students, and were delighted to have been featured in 2 books and 11 newspaper and magazine articles (including the Sunday Times and Evening Standard). On the harvest front, we gathered £1,692.84 worth of food from the garden (as calculated by Capital Growth‘s Harvest-ometer) which was slightly down on last year as one of of colonies of bees decided to steal honey from the other colony rather than make their own, don’t worry, we will be given them a refresher training course in urban foraging as soon as the weather warms up! As they say, ‘Team work makes the Dream work’ and it’s definitely been a year of partnership to make some great memories throughout the year. 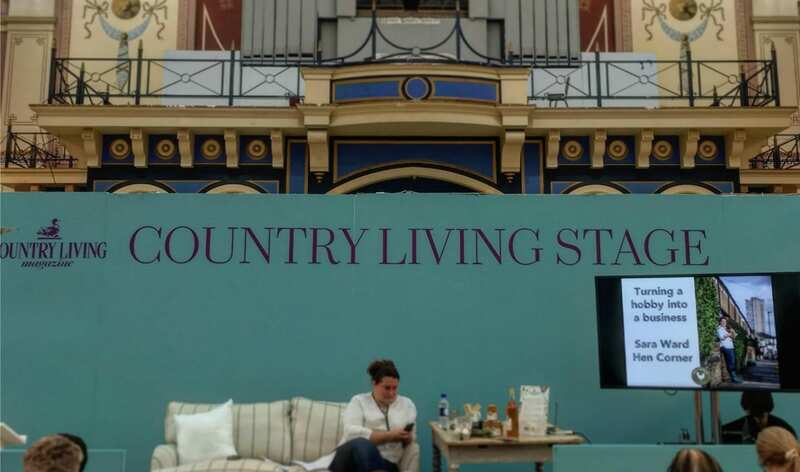 Country Living Magazine brought their Spring Fair to Alexandra Palace in April and not only invited us to give talks throughout the event but also built us our very own chicken enclosure in the Small Holding Garden allowing us to bring a selection of chickens with us for the week. They were very popular and seemed to enjoy all the attention! Later in the year Country Living brought their Christmas Fair back to the Business Design Centre at Angel along with a couple of new theatres, it was a privilege to run Christmas Wreath demonstrations in the Country Living Corner and make Majestic Mango Chutney in the Country Living Kitchen for their guests throughout the week. Omlet are the fantastic people that create the groovy Eglu chicken coops and Beehaus that we have here at Hen Corner and if it wasn’t for them I can’t see how our journey would have begun. We’ve been running courses with Omlet, teaching people how to keep chickens since 2010 and have partnered together for several projects over the years. This Spring they kindly loaned us new coops to take to Alexandra Palace, in the Summer they asked us to run some training days for their staff team and in Autumn they invited us to present some fabulous festive food recipes showcasing the wonderful eggs from our hens and delicious honey that we collect from our bees. Cultivate London is a Social Enterprise that we support as a Director/Trustee and it’s been fun to join in with many events at the beautiful Salopian Garden throughout the year, sometimes bringing the chickens with us! Both our Bread Baking workshop using the wood fired cob oven and the Christmas Wreath session in the cosy polytunnel went down very well. We started and finished the year with visits to Richard Bertinet’s Cookery School in Bath, and even had a cheeky midsummer trip to learn how to make Croissants and Viennoiserie in June, this has been great fun and a real investment into our Micro Bakery. September found us driving up to Yorkshire for a long weekend selling our Apple & Chilli Jelly at the Town End Farm Shop in Airton. We were part of a special pop-up market showcasing preserves and met some other great food producers whilst we were there. The final highlight of getting together with friends last year was meeting long time Blog Buddies, Margo and Becky. Margot’s blog, Margot Tries The Good Life, is about leaving London for a Hampshire Smallholding and we were thrilled that she was able to bring her lovely daughters to our Bees for Children course in the summer, we are following her journey as she and her family transform a old cottage, complete with lavender fields, into a thriving smallholding. Becky’s blog, Rue Du Belvedere, is about the new life that Becky and her family have chosen in South West France, we’ve visited their home on a previous holiday and this summer were very excited to join them for a tour and BBQ at the old farmhouse that they are restoring, again with great plans for a creative business, and we can’t wait to see how it all unfolds. All our Courses for 2018 are now open for booking online, have you a New Year’s Resolution to master Bread & Baking, have a go at Making Cheese or try your hand at Bee Keeping? We are very excited to confirm that we are planning to install a wood fired bread oven in the garden, this will be perfect for specialist bread courses and supper clubs, would you like to join us for dinner in the garden with home made food cooked on the terrace whilst sipping our famous apple wine? We are also looking forward to some new media opportunities, so watch this space, and you never know, this could be the year that we start writing our first full book. We gave the bees some extra food to keep them going over winter, fortunately, both colonies seem happy – huddled up to keep warm. We hear that we’ve been featured in three magazines this month! The Richmond Magazine, Living In and Country Living Magazine, we’ll post up full details on our Press page once we have the copies in our hands..
Have you started making plans for this year? What’s top if your list to achieve? Wow what a busy year! I’m going to have to find a way to get to one of your beekeeping classes, my brother has bought us a load of bee keeping stuff for Christmas and we’re keen to get going with it at some point. Wishing you a very successful and happy 2018! I’m sure your year has been just as busy Becky! Bees would be wonderful on your farm, are there other Bee keepers nearby that could support you? What a fantastic year! Beats me how you fit it all in! Keep producing, cooking and entertaining customers with your own urban (Hen) corner of delight in West London. Thanks Brian, we’ll do our best! We had such a lovely time at your hen course and you were right about them being quite addictive, since moving to the country three months ago we’ve already racked up six and my husband is planning a huge meat flock for the summer- you were an inspiration! Thanks so much for this Catherine, it’s great to hear of the exciting adventures that course guests go on to!